Quick recap: Roy Hobbs appears seemingly out of nowhere to join a baseball league and in the span of one season becomes a legend. Fun (?) fact: ‘Shoeless’ Joe Jackson was one of the inspirations for the character of Roy Hobbs. I’m sure there are more interesting facts out there about this movie, but my knowledge of baseball is very tiny and this was the only name I recognized. My thoughts: Being left-handed, my dad used to joke with me that I would make an excellent baseball player. I loved the idea, but the truth was that the sport terrified me growing up. I played softball for a few seasons and I remember my mother bribing me with money if I would at least swing the bat and not cower in fear. No dice, mother. I still love the concept of the game, but I’ll leave it up to the professionals and tiny children who are braver than me to play. So, Robert Redford, who played Roy Hobbs, was basically made for this role. His character is almost sickingly sweet with his high morals, but it works in this context of an old fashioned baseball legend. Any other person playing the role and I would’ve scoffed my way through the film, but with Robert Redford as the lead, I’ll let it slide. I have no idea if he plays baseball in real life, but he seems like the sort of person that would join a game for the fun of it. The plot didn’t do much for me, but I can’t really remember why. My thoughts kind of glazed over at some point into a patriotic babble of apple pie, cookouts and playing catch with the Old Man. The Natural is one of those movies that gets passed down between father and son to strengthen an already intimate bond. It doesn’t really matter what happens because in the end, everyone is happy and America continues marching forward and bald eagles soar and……you get the picture. Final review: 4/5. I thought about something lower but I feel any less would be unpatriotic. Up next: Who’s Afraid of Virginia Woolf? Quick recap: Jake LaMotta was a talented boxer in the 1940s and also a huge jerk. My thoughts: Is it wrong to like a movie simply because it is the ‘anti-movie’ of something else? I didn’t love Rocky because it felt too inspirational and didn’t match up with my belief that boxing is a very violent sport. Raging Bull definitely shows the opposite and cutting all the inspirational crap endeared it to me a bit. I’ve never been a fan of sports movies precisely because they are too sweet and rely heavily on the flawed character to save the day. Jake LaMotta is ALL flawed character (and still alive at 98!) and no real redemption, which made it the perfect ‘anti-Rocky’. 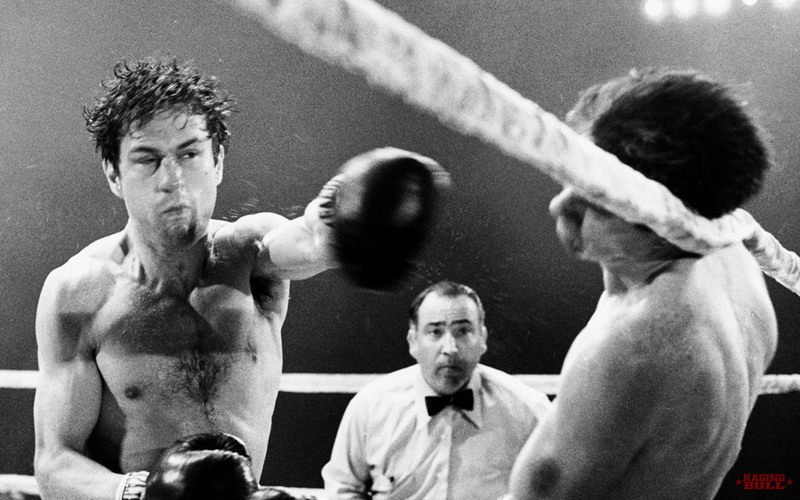 Without a doubt, Raging Bull should be seen for the acting alone. Joe Pesci and Robert De Niro were phenomenal as brothers Joey and Jake LaMotta. I have no idea how accurate the film is, but De Niro’s performance especially made me believe that I was watching the real thing. Most people are impressed by the boxing scenes and how realistic they were (and many did involve real punching), but I was more impressed by how well De Niro was able to show his character’s downfall. The final scene where LaMotta is practicing the monologue from On the Waterfront, many years after giving up boxing was the perfect ending to such a sad movie. Final review: 5/5. 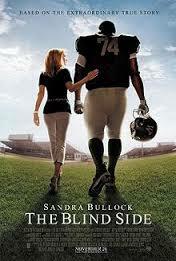 Not my favorite movie, but a masterpiece nonetheless. Quick recap: Rocky Balboa is a boxer who has essentially wasted his life fighting the wrong people. But then the champion of the boxing world, Apollo Creed, challenges him to a match for the title. 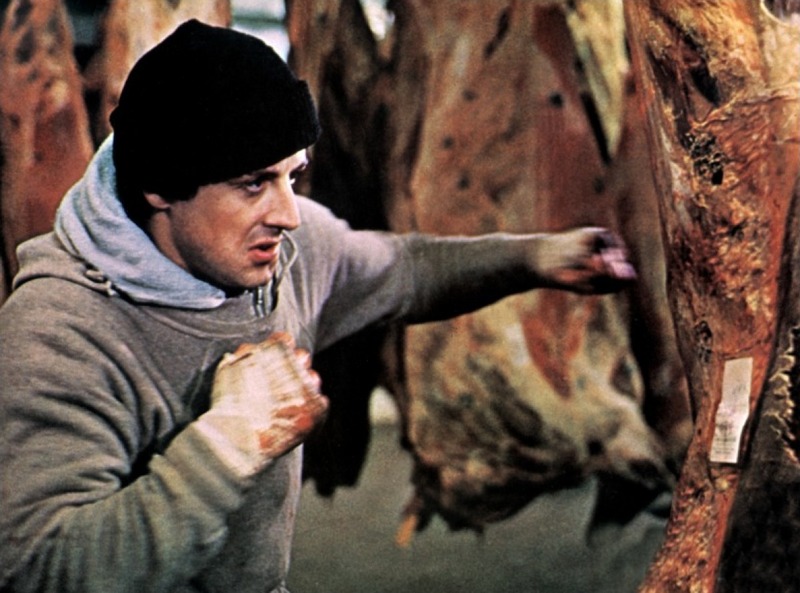 So Rocky eats raw eggs, runs up stairs and punches meat to train. He also manages to fall in love with a shy pet shop employee to prove that at heart, he’s a lover not a fighter. Or something like that. I doubt PETA very much liked this scene. Do they care about carcases though? Fun (?) Fact: The poster of Rocky displayed at the boxing ring with the wrong color shorts was an actual mistake. Not having time or money to fix the mistake, Sylvester Stallone added dialogue where he points out the inaccuracy. My thoughts: After watching this movie and trying to decide how to review it, I came to the conclusion that I’m in a sort of pop culture dilemma. Although this was my first time seeing the movie, I already knew many of the scenes and even the outcome. I basically sat through the whole thing just so I could cross it off of my list and say that I did it. That’s not to say it wasn’t an enjoyable film but it left me a bit underwhelmed overall. I almost feel a sense of guilt for not getting into the spirit of the movie and rooting for Rocky. And to top it off, in doing this project, I know that I’m going to run into more iconic movies that I mostly know the story but have never seen in their entirety. The most fair thing I can do is try to see Rocky as a moviegoer would in 1976. It was a time before anyone really knew Stallone so his acting ability seemed impressive. And just like nowadays, people back then ate up those feel good sports stories. at least I wasn’t subjected to this. Rocky’s story, if you look past the cheesiness, is endearing. Stallone lays it on a little thick as to how sweet Rocky is underneath all that violence, but the point is made nonetheless. I was most surprised by Adrian’s character because I always pictured her as some italian bombshell, not this shy girl in glasses. I really enjoyed her transformation and how loyal she stayed throughout everything. I did not, however, enjoy the billion times Rocky said, ‘Yo,Adrian!’. It felt a too heavy on the Italian stereotype. Then again, James Gandolfini just passed away and I could watch Tony Soprano for hours without getting bored or annoyed. Final Review: 2/5. I can see why it is an iconic movie, but it’s just not for me.